Our guest bath is yellow and gray chevron and I totally love it! I helped my mother redo her guest room (my old bedroom) and it is blues with a splash of yellow. I bet the mirror would look great in her Guest Room! 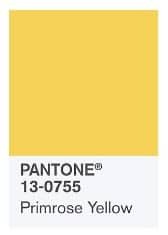 Each season, Pantone puts out a list of the colors of the season. This buttery yellow is one of Pantone’s Spring 2017 colors. Isn’t it beautiful? I am always drawn to yellow clothes, so it really excites me that I will see more of this color in the shops for the next few months! At Miller Manor, we have Special Walnut furniture and Brushed Nickle metal throughout most of our house. These two colors make it very easy to decorate in pretty much anything we want. 🙂 You will also find white baseboards and windowsills throughout the entire place. These neutral colors make it easy to do whatever we want, without clashing. So, I get to update our decor colors multiple times per year. In a house this size, it is a pretty big production, but I don’t really decorate everything yet. 😀 One day, when my kids move out, I will most likely do the entire house. While I never want my kids to move, I can’t wait to redecorate my entire house every season! When I say “I update decor colors” I don’t really mean everywhere. Our guest bath, as I said above, is grey and yellow chevron and it doesn’t change… in fact, it has been the same for the entire 2 years we have had this house! It was the very first room to get decorated! I still love it! So, really the only places that change with the seasons is the living room, dining room, stairwell, and entryway. Everything else just stays the same. One day, I will have enough goodies to redo more rooms seasonally. Do you change your home’s decor often? 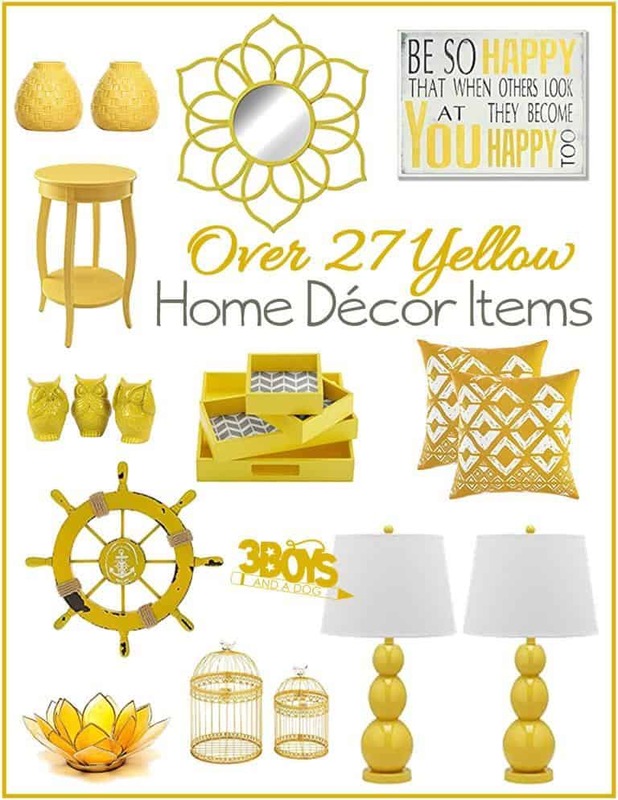 All of the following Yellow Home Decor Accents pieces are chosen by me for you (and me) and contain affiliate links. You can click the image to get the item. Decorative bookends Brackets. Curly Braces. 4pcs 100% Handmade Wicker Rattan Balls – I love to add decorative balls to bowls or just have them sitting on a shelf. 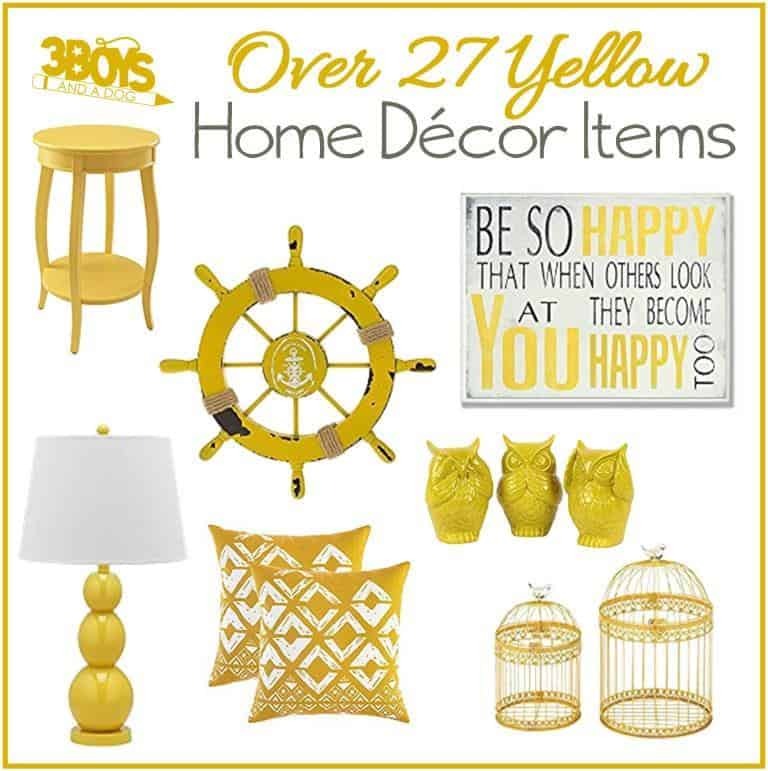 These rattan balls are an easy way to add some cheaper priced Yellow Home Decor Accents to your collection.